Do you agree with our Ireland starting XI to face Wales? Manager Martin O’Neill has some tough calls to make ahead of tomorrow’s Nations League opener with Wales. DARREN RANDOLPH HAS made a solid start to the season with Middlesbrough and so will almost certainly play in goals barring any late injuries. Defence is the area where Ireland are best set in terms of depth, which is one of the reasons why Martin O’Neill might be tempted to go 3-5-2/5-3-2 — a formation he has previously experimented with in friendlies. At centre back, Shane Duffy and Ciaran Clark have been in decent form for their Premier League clubs and have been preferred in the past, so they both look nailed on to start. The identity of the prospective third centre back is less obvious. Richard Keogh is the most experienced of the remaining candidates but has looked less than convincing at times for Derby this season. Kevin Long has yet to play for Burnley in the Premier League and may lack the necessary match sharpness. That leaves John Egan as the sole remaining option in terms of natural centre backs. The 25-year-old has enjoyed a decent beginning to life at new club Sheffield United and consequently could be rewarded with a first competitive start for his country. In terms of wing backs, Coleman would be an obvious pick on the right. On the other side, Stephen Ward at 33 might struggle in terms of the extra running required in that position. Enda Stevens has done well for Sheffield United, though the fact that Matt Doherty is a regular Premier League starter, which makes him a relative rarity in this Irish squad, should boost his chances of playing. The Dubliner is not a natural on the left, but has played in the position for Wolves on occasion. Worryingly, almost no central midfielders in the current squad have been playing 90 minutes regularly this season. Conor Hourihane has made just one start for Aston Villa. David Meyler has started five Championship games for Reading but has been taken off in all bar one. Alan Judge has yet to start a league match for Brentford, coming off the bench four times. Jeff Hendrick has started all four of Burnley’s Premier League games but has completed 90 minutes just once. In terms of wingers, Daryl Horgan and Callum O’Dowda have both made two league starts for their respective clubs, with the latter yet to complete 90 minutes. Shaun Williams is the one exception to the generally discouraging outlook, completing five out of six of Millwall’s Championship matches. So it’s difficult to pick players on form when the majority of the squad have got off to less-than-ideal starts for their clubs this season. Playing away against a Wales team who are likely to have more of the ball, O’Neill will probably decide to include a couple of solid performers in the middle of the park. Hendrick, Meyler and Hourihane are the most experienced options available, so it would no surprise to see them line out. O’Neill may also be tempted to play O’Dowda, who he has shown faith in recently – picking the youngster for the first leg of the Denmark World Cup play-off clash. The Bristol City winger is one of the few players in the Irish squad who looks totally comfortable on the ball and is capable of taking players on. Another area where O’Neill doesn’t have an abundance of options due in part to injuries to Shane Long, Scott Hogan and Sean Maguire. Jon Walters, comfortably the most experienced forward available, will surely feature. Who joins the Ipswich player is not easy to predict, with Graham Burke, Callum Robinson and Aiden O’Brien the obvious options. Robinson has arguably shown the best form of the trio at club level, and so could be set for his debut. Predicted starting XI (4-4-2): Randolph; Coleman, Clark, Duffy, Ward; Hendrick, Hourihane, Meyler, O’Dowda; Walters, Robinson. Midfielders: Alan Judge (Brentford), Jeff Hendrick (Burnley), Conor Hourihane (Aston Villa), Shaun Williams (Millwall), David Meyler (Reading), Daryl Horgan (Hibernian), Callum O’Dowda (Bristol City). Forwards: Jonathan Walters (Ipswich Town*), Graham Burke, Callum Robinson (Preston North End), Aiden O’Brien (Millwall). Email “Do you agree with our Ireland starting XI to face Wales?”. 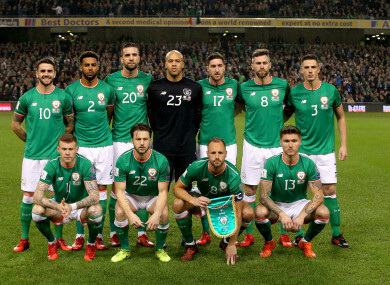 Feedback on “Do you agree with our Ireland starting XI to face Wales?”.